Breast cancer is the most common cancer diagnosed in women. Treatments typically include surgery, chemotherapy, radiation, hormonal and other targeted drug therapies, which, coupled with early detection have increased five-year survival rates from 63 percent in the early 1960s to 90 percent today. Growing evidence, however, suggests the physical effects of these breast cancer therapies can be taxing — causing pain, shoulder problems, fatigue, weight gain, weakness, lymphedema and osteoporosis. The authors of a new breast cancer care model are hoping to change that. The Prospective Surveillance Model (PSM) aims to promote monitoring for breast cancer related physical impairments during and after treatment. The model was developed over the past year by a panel of diverse breast cancer experts in collaboration with advocacy groups and with funding support from the American Cancer Society and the Avon Foundation. The model of rehabilitation is the first step toward greater awareness and recognition of the importance of incorporating rehabilitation services in breast cancer care and offers hope for improved quality of life among breast cancer survivors through rehabilitative therapy and exercise. 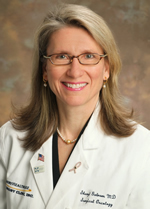 "The current model of medical care for women with breast cancer focuses on treatment of the disease, followed by intermittent surveillance to detect recurrence and any other problems patients report," says Sheryl Gabram, Grady Health System surgeon-in-chief and director of the AVON Comprehensive Breast Center at Grady. "While both of these are, of course, extremely critical, most women may have subtle physical impairments as a result of their breast cancer treatment that impact function and quality of life. This new initiative is exciting because never before have breast cancer patients had a dedicated plan to guide functional rehabilitation, identify an individualized rehabilitation prescription, and promote healthy behaviors during and after cancer treatment." The PSM, which is still in the testing phase, promotes careful watch of common breast cancer-related physical impairments and functional limitations, through education, early detection, rehabilitation and exercise programs when impairments are identified. This proactive approach to functional assessment and rehabilitation occurs through periodic examinations and therapies both during and after cancer treatment. "Our research suggests that if feasible, a pre-operative assessment followed by an early postoperative reassessment visit should take place 1-2 weeks after surgery, and upper-extremity range-of-motion exercises should be initiated within the first month after surgery," says Gabram. "Being among the first centers to implement this innovative model affords an opportunity to study the true incidence of treatment-related impairments, the feasibility and logistics of implementation, its associated costs and the degree of patient benefit derived," says Gabram. Gabram and her team, which includes Jill Binkley, executive director of TurningPoint Women’s Healthcare, a not-for-profit women’s rehabilitation center, and Winifred Thompson, PhD, from the Emory’s Rollins School of Public Health, will test the prospective surveillance model by interviewing patients prior to surgery, asking them a set of standardized questions and measuring their arm function. This will be followed by a close surveillance plan and early intervention if any impairments are detected. Researchers will measure compliance to the model and identify barriers to early intervention. The pilot study is expected to open in November 2012. "The Georgia Cancer Center for Excellence (GCCE) at Grady Health System is committed to treating the whole person, not just the cancer. Our intent is for patients to have the same quality of life after cancer treatment as before, including the ability to function independently," says Gabram.